When Airplane! hit movie screens in 1980, I was 13 and should have been a prime target to see the film. Its kind of madcap humor seems perfect for someone in that age group, and the picture certainly did enough business to warrant my attention. However, although I wanted to see Airplane!, I didn't. My failure in this regard happened for reasons I don't recall, but I'll blame my Dad for them - why not? Airplane! functions as a very broad spoof of all the disaster films that were so popular back in the Seventies. Although the Airport movies of the Seventies connected to it in title and theme, it used 1957�s Zero Hour as its main inspiration. I don't think my situation is that extreme. After all, I do enjoy film comedies, and it's not as though I only go for allegedly intelligent products such as Woody Allen�s pictures. I like some movies that many consider stupid, such as things like Billy Madison. 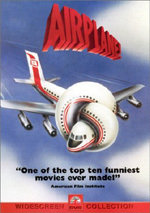 However, I see a spark of creativity in those films, whereas Airplane! just seemed asinine. Airplane! appears in an aspect ratio of approximately 1.85:1 on this single-sided, single-layered DVD; the image has been enhanced for 16X9 televisions. This was a consistently mediocre transfer with a number of problems. Sharpness usually seemed decent to good. Occasional shots came across as a bit tentative and soft, though, and I can�t say the image often looked razor sharp. However, it mostly maintained positive definition and didn�t cause too many distractions in that department. I noticed no issues with shimmering or jagged edges, and edge enhancement appeared to be absent. Print flaws were a bigger problem. The movie demonstrated moderately consistent examples of specks and grit along with some nicks and blotches. At times it offered decent cleanliness, but it became awfully messy on other occasions. Music easily fared best throughout the soundtrack. The score usually appeared nicely bright and brassy, and its dynamic range was quite broad. Across the board, the movie�s music sounded lively and dynamic. That factor redeemed the rest of the audio to some degree, but too many flaws popped up for me to give this mix a grade above a �C+�. When we head to the extras, we get the movie�s trailer as well as an audio commentary from writers/directors Jim Abrahams, David Zucker and Jerry Zucker plus producer Jon Davison. All four sat together for this running, screen-specific chat. Since the first three men also participated in the somewhat-annoying track for The Kentucky Fried Movie, I feared this piece would be similarly irritating. However, I largely found it to offer a very interesting and compelling discussion of the film. Other than the commentary, we only find the movie's theatrical trailer. It gives away a lot of the film's gags, but considering the massive number of jokes packed into its 87 minutes, plenty more remain to be uncovered. And maybe you'll be happy to discover these pieces of humor, but Airplane! did almost nothing for me. I find it to offer an unpleasantly stupid and uninteresting program from start to finish. The DVD provides rather bland picture plus flawed but generally solid sound and a mostly good audio commentary. Fans of the film and the genre will likely love Airplane!, but if you're a doubter, pass on it; I don't think it'll generate many converts. 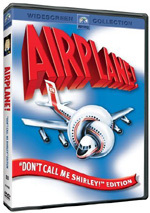 To rate this film visit the "Don't Call Me Shirley" Edition review of AIRPLANE!